Yesterday I was led to a trailer for a movie I'd heard absolutely nothing about with the intriguing title Beyond the Black Rainbow. Now, I don't normally come over all excitable about trailers but this one instantly made an impact. The retro typefaces, block colour schemes, minimalist interiors, industrial exteriors and an analogue synth score composed by Jeremy Schmidt of Canadian rock band Black Mountain. This is sci-fi with an edge, a feel for design, a fittingly 'other-worldly' milieu and a sinister, lingering, unsettling aura. I shared it on Twitter and Facebook and the feedback was uniformly positive, with suggestions as to the movies/shows it evokes. 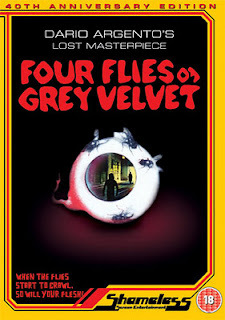 Phase IV, THX 1138, early Cronenberg, Altered States, Lost - hallowed company to be compared with. 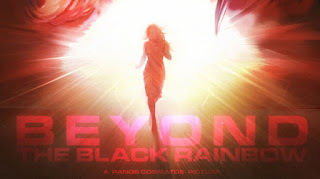 It's no mere parody of or homage to any of those though, the trailer for Beyond the Black Rainbow (what is the black rainbow? The edge of sanity? Death?) firmly establishes its own clearly defined hermetic universe. Described as 'a Reagan-era fever dream' inspired by 'memories of midnight movies and Saturday morning cartoons'. First time director Panos Cosmatos' movie has also been likened to a cross between 2001 and The Prisoner, and follows in the wake of the similarly off-kilter Canadian sci-fi/horror movie Pontypool. Watch the trailer and be prepared to be wowed and sucked into Black Rainbow's creepy, stylised world. Some films make your heart beat faster or prowl through your dreams – this one from 1953 I simply love for its humanity. Federico Fellini’s I Vitelloni (which roughly translates somewhere between veal calves and young bucks) follows a group of young men in a seaside town like his birthplace, Rimini. These boys are well-dressed and pampered by mothers, sisters and girlfriends. They dream of fame as singers,writers or film-stars yet they simply kick around town, playing pool, taking the odd dead-end job and letting people down. 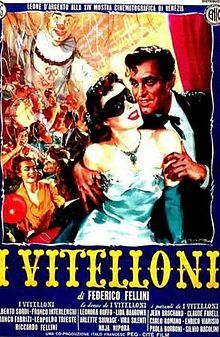 It’s less flamboyant or self-conscious than later Fellini but all the themes are there – wry memoir, fabulous interludes like a carnival ball and moments of casual absurd beauty. One baleful winter Sunday, the boys go to the deserted beach: it’s magical, elegiac. Fausto, the charmer, takes his adoring new wife to the cinema. While she’s rapt at the glamour onscreen (the fridge! the beautiful actors!) he spies a femme fatale in the audience and recklessly pursues his own fantasy. Deep dissatisfaction with home versus the bonds that keep you there, paralysed with yearning – I Vitelloni is a hilarious, vivid, tender portrait of people who could be stars in their own lives, if they could only accept their frailty. Francine Stock is a novelist and radio and TV presenter. Francine is the chair of the Tate Members Council and was the first female Honorary Fellow of Jesus College, Oxford. After stints presenting Newsnight, The Money Programme, The Antiques Show and Front Row Francine now hosts The Film Programme on Radio Four, and her latest (non-fiction) book is In Glorious Technicolor: A Century of Film and How it Has Shaped Us. Another week and another 'found footage' movie comes along, but as we all know it's quality not quantity that counts and Howie Askins' Evidence, written by and starring Ryan McCoy, is one of the better recent entries into the current go-to-genre. It does Evidence no disservice to say that the whiff of The Blair Witch Project, Paranormal Activity and [Rec] pervades throughout the movie, as McCoy's narrative flies off in unexpected directions and the movie itself undergoes an eye catching shift in tempo from creeping tension into outright frantic, relentless and gratifyingly entertaining chaos that more than offsets any possible 'found footage' fatigue. The generic, and flimsy, set up sees Ryan (McCoy) and three friends heading off for a camping expedition to an isolated spot, (highlighted by a 'no trespassing' sign the friends dutifully ignore), a trip that forms part of a documentary Ryan is making on his best friend Brett (Brett Rosenberg). Quite why annoying dullard Brett should be the subject of a documentary is not clear, but this lazy narrative catalyst soon falls by the wayside as the stock-in-trade gang, completed by Ryan's girlfriend Abi (Abigail Richie) and her pal Ashley (Ashley Bracken) begin to suspect their idyllic seeming weekend away might not be as much fun as they were hoping for. Hearing unexplained noises on the first night and catching a glimpse of what appears to be a Sasquatch type creature the following day leaves Brett and the girls desperate to pack up and head home but puts Ryan in the mood to, as all good movie documentarists do, stay put and see what he can capture on his video camera. 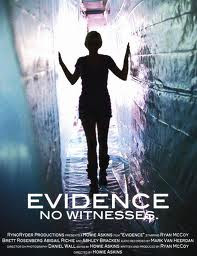 So far, so average, but Evidence is a movie of two halves, and after the slow burn of the set up it ramps up the action after Brett goes missing and the rest of the group realise that they are being hunted by someone, or something. Without wishing to divulge any spoilers it's enough to say that the someone or something is not what you might be expecting and the rest of the movie, which is made up of extended, and increasingly revelatory chase sequences, lasting around thirty minutes, takes Evidence into genuinely exciting territory that demands you keep your eyes on the screen right through the end credits. Askins and McCoy's genre outing employs all of the stylistic elements familiar from the 'found footage' movie and throws in many of the narrative themes seen in its predecessors, but, to their credit, what could have been a run-of-the-mill knock off emerges as a highly enjoyable and deftly constructed movie whose success comes in the way it has fun with the genre traits and narrative themes it employs. I've done a special review for Rogue Cinema on the 40th anniversary release of Dario Argento's Four Flies on Grey Velvet. This early career Giallo from the cult Italian director hasn't been available for close to twenty years, so kudos goes to Shameless Screen Entertainment for this welcome release.